More than 1,400 couples joined together to reaffirm their wedding vows in over 70 venues across the UK on 8 February 2014. It is anticipated that The BIG Promise will set a new world record for the number of couples doing this simultaneously. Vows were reaffirmed from Bournemouth to Sunderland and one hundred couples took part on the island of Orkney alone! 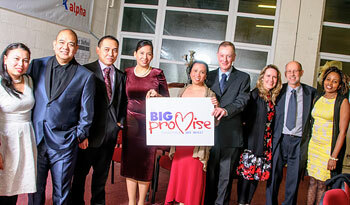 The BIG Promise is the flagship event of Marriage Week 2014 which runs from 7-14 February each year. The golden wedding anniversary of Tom and Doreen Shaw from Sheffield coincided with the record attempt and they celebrated their 50 years together by reaffirming their vows in front of their whole family. Tom Shaw said: "We were thrilled to remind each other of the promises we made to each other 50 years to the day that we first said them! This has been such a special day as we have celebrated our commitment to each other with our family and friends. It has been quite moving to look back on how we have been blessed and challenged throughout our life together. And after 50 years, it's not over yet. The best is still to come!"